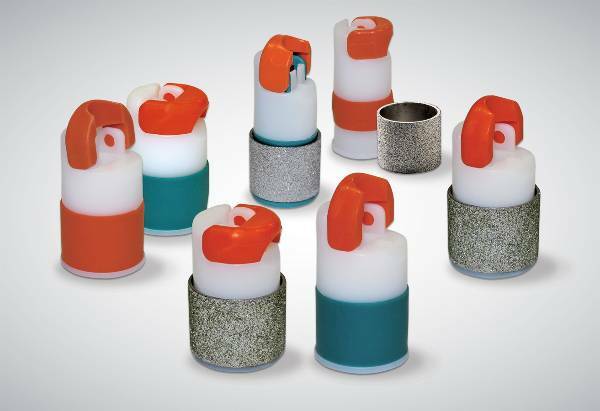 Features a reusable bit holder and high-tech diamond bits available in various diameters and grits. The Quick-Fit Bit System includes one standard grinding bit. Additional or replacement bits can be purchased separately, available in both 3/4" and 1" sizes in fine, standard, and rapid grind. High-impact polymers extend the life of the Quick-Fit Bit Holder and eliminates the possibility of corrosion. Engineered with industrial elastomer, the Quick-Fit Bit Holder absorbs grinding vibration and protects glass from fracturing or chipping. The Quick-Fit Bit holder may be adjusted vertically on the grinder shaft, and may be reversed to utilize the full glass grinding surface. Flip the orange lever UP on the Quick-Fit Bit Holder, add bit. Then slide DOWN onto grinder shaft. Flip the orange lever DOWN to expand the Quick-Fit Bit Holder, and lock in place. No keys or locking tools required! 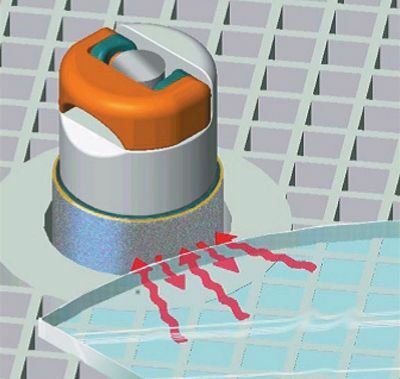 The Quick-Fit Bit holder may be adjusted vertically on the grinder shaft to fully utilize the glass grinding surface. Use the 100 series for all Inland, Glastar (except the G8 All-Star), & Gryphon Studio grinders. Use the 200 series for THE Grinder, Glastar G8 All-Star and all Diamond Tech grinders.